The most beautiful underwater shots will be sought from April 27 to May 1 during the Open Fotosub event on the coast of Telde in Gran Canaria. For the first time, the festival will be linked to the Canary Islands Championships. The number of participants is limited to 25. 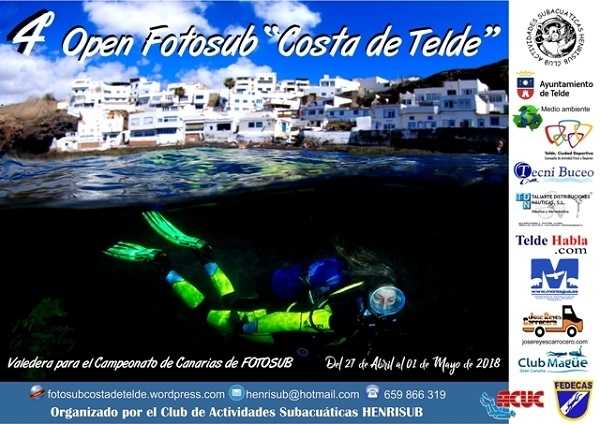 If you want to participate, you can register until April 24 at Club Henrisub Actividades Subacuáticas, Calle Lomo Las Brujas 1 in Telde or send an e-mail to henrisub@hotmail.com The underwater shots will be taken on the coastline between Melenara and Taliarte and in Tufía. Compact and digital reflex cameras are permitted. Produced with news.CMS in 0,1180 seconds.